Redgate Beach is one of the most beautiful in Torquay, but now officially out of bounds because it gets cut off by the tide. In the old days there was a concrete walkway which enabled access, and old postcards from the 60s and 70s show the beach absolutely packed. You can still get there if you're prepared to walk the sheep path down the cliff from Walls Hill, or to scramble around the rocks at low tide, but if you swim of course the beach is open all hours. A gang of us arrived to find it looking stunning: fine sand, pink rock and most of all the sea stretching out in front, a wonderful juicy green. We climbed down the rocks from Anstey's Cove next door, and were soon swimming in the protective curve of the cove, bathed in sunlight and sparkles one minute, then shrouded in grey the next, as the clouds came and went. The sea was changing colour all the time, and although it wasn't completely clear we could still see rocks and seaweed - and Carole and Helen who did a bit of underwater diving.Jackie and I decided to swim to Long Quarry Point which forms one arm of the cove. 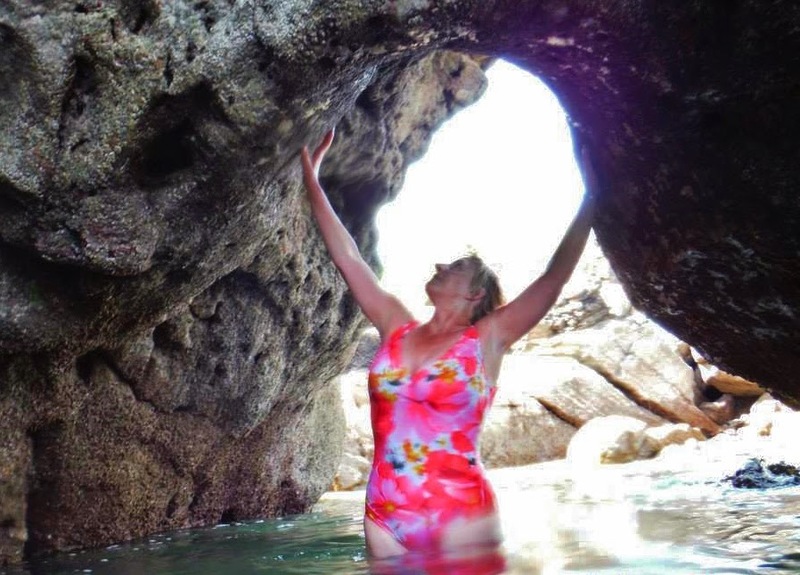 We were hoping to go into a cave behind the pinnacle, which has a secret swimming pool. However as we approached, the sea started to get more choppy and there was too much swell to get into the cave. I suppose that's one of the frustrations - and joys - of swimming in the sea. You never quite know how a swim will turn out. After the heatwave comes the rain. Drops hammer the river, and freshness descends. The river is framed with a tracery of acid green leaves and the water flows darkly. 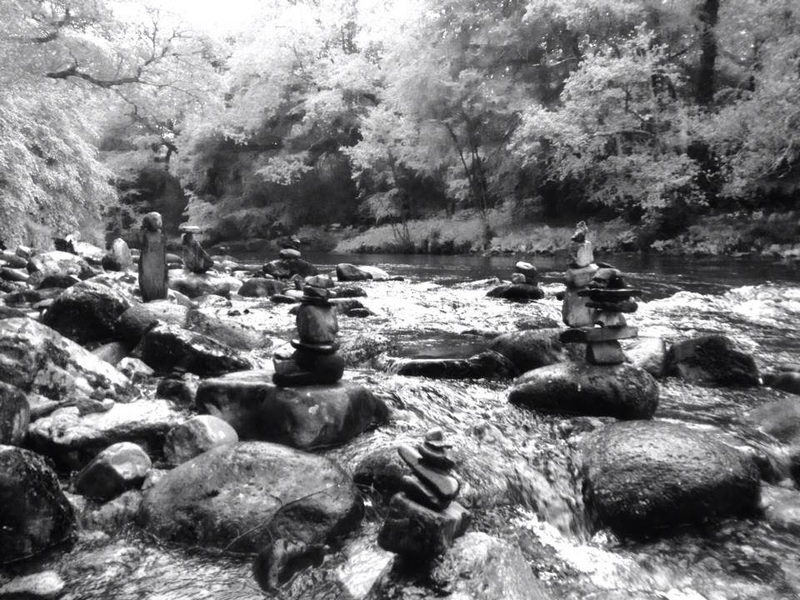 As we swim we see the stone sentinels on guard by our pool. They glisten in the wet as the river roars past. We are blessed with a mini heatwave at the moment and it is just so refreshing to go for a post-work dip in the river. As we walked along the bank amongst the fading bluebells and garlic the sun was bouncing off the surface and crowds of insects swarmed above the water. Miggy spotted a sea trout sitting quietly above the weir. We swam upstream, almost blinded by the sun. The current was strong but I was determined to get to a little island I've called Hairy Rock on account of the weed which grows on it, which, underwater, looks uncannily like human hair flowing in the wind. As we gathered on the beach at Elberry Cove the sun was out and the sea was sparkling. The water is finally starting to clear after the murk of the stormy winter, and as we waded out, Jackie and I remarked on that delicious feeling of anticipation of all the summer swims ahead. We pottered along the crinkly coastline towards Broadsands, swimming through lagoons and channels, and looking up at miniature cliffs, packed with exotic shapes in the limestone. As Jackie said, it was Gaudi-esqe . 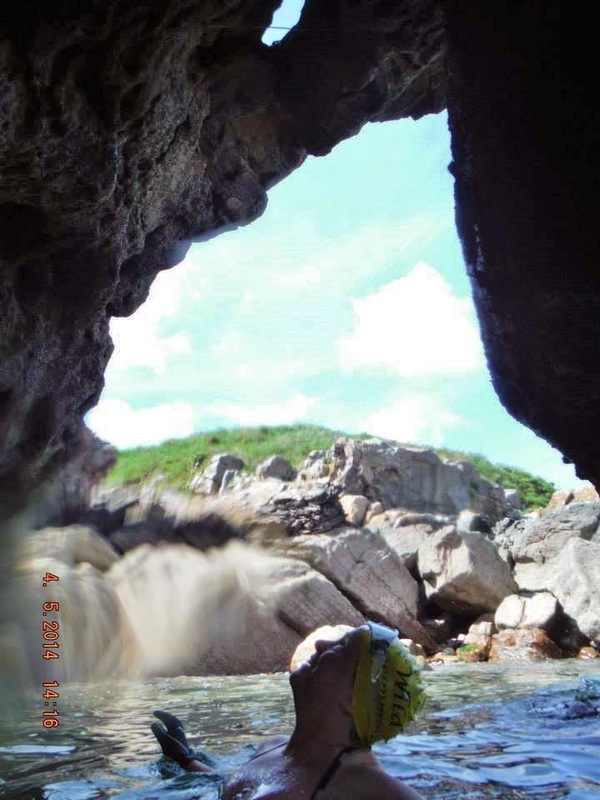 We then came across an arch that we swam under. It was like being in fairyland. Thanks to Jackie for the pictures. It is natural to want to share lovely places, but sometimes the sharer wants to keep them secret, which is totally understandable. One evening recently I was taken to a new place, and told, under pain of death, not to reveal its location. 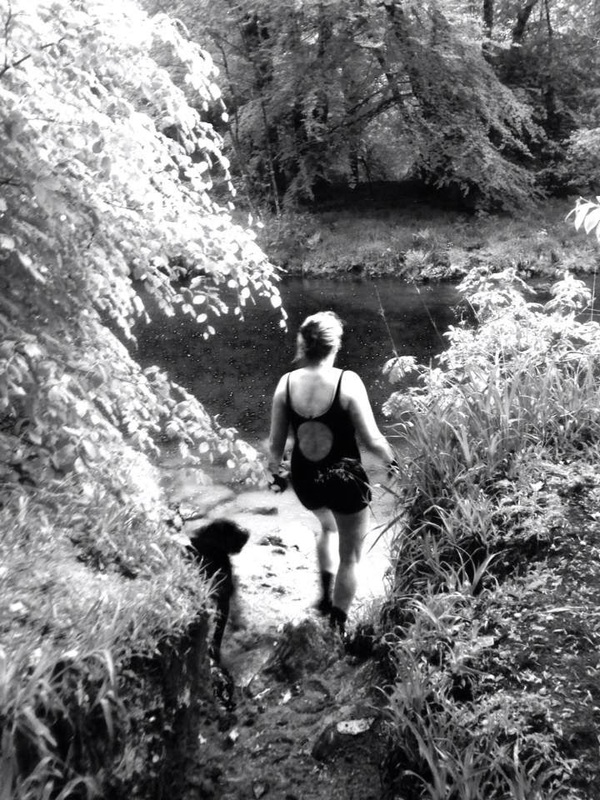 We swam in the setting sun, with Buddy the bouncy labrador, in the wide and wonderful river. It felt good to be alive. Thank you to my secret sharer!